Please arrive between 9:30 and 9:50 as doors close promptly at 9:55am. All payments are nontransferable & nonrefundable. Your payment might be tax deductible; please consult your accountant or tax advisor. Cosmos Tree Weekend Of Upliftment & Grace! Created and Facilitated by Dr. Roger B. Lane. Suggested Donation of $10 for Meditations and Talks. 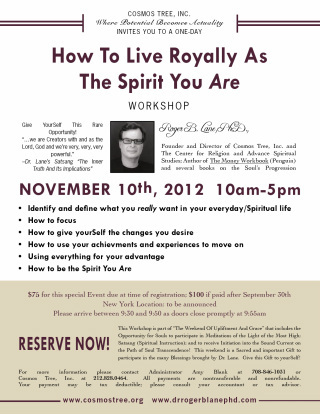 RSVP Required for Workshop; highly suggested for other Events.